The critically-acclaimed Yale in New York series presents PAUL HINDEMITH: MASTER AND PRANKSTER on April 25 in New Haven and April 28 in New York. The program marks the 50th anniversary of the death of the prolific composer and former Yale professor. The preview performance takes place Thursday, April 25 at 8 pm at Morse Recital Hall in Sprague Hall. The Yale in New York event takes place Sunday, April 28 at 7:30 pm in Zankel Hall at Carnegie Hall. Julian Pellicano ’07MM, ’09MM has been appointed the resident conductor of the Winnipeg Symphony Orchestra in Manitoba, Canada. He will lead the orchestra in Pops, Soundbytes, Concerts for Kids, Specials, and educational concerts. The appointment begins in September 2013. In addition to his duties with the WSO, Pellicano will join the conducting faculty of the University of Manitoba and serve as the music director of the University of Manitoba Symphony Orchestra. Yale Opera has announced the casting for its upcoming production of Tchaikovsky’s Iolanta. The opera, which will be performed May 3 and 4, is a fairy tale about a princess who experiences the transformative power of love. On March 30, 2013, baritone David Pershall ’10MM, 11AD won the Marcello Giordani Foundation International Vocal Competition in Vero Beach, Florida. In collaboration with and under the sponsorship of the Vero Beach Opera, the primary objective of the competition is to “lead talented young singers toward a successful career on the operatic stage.” The first prize was an award of $10,000. The Marcello Giordani Foundation is a non-profit organization committed to the promotion of Italian opera and culture throughout the world, and specifically to the encouragement of a new generation of dedicated young opera singers whom it hopes will foster the future of opera. The Vero Beach Competition is in its third year. David Pershall has won many prestigious vocal awards, including first prize in the New Jersey Verismo Competition and the David L. Kasdon Memorial Prize for the Outstanding Singer at the Yale School of Music. This year he joined the roster of the Metropolitan Opera as the first cover of Lord Cecil in Maria Stuarda. Additionally, he appeared in concert performances with Dallas Opera, premiered as Zurga in Les Pêcheurs de Perles at Virginia Opera, and premiered as Figaro in Il Barbiere di Siviglia at El Paso Opera. Buryl Red ’61MM, a conductor, producer, and arranger known world-wide as the musical director of The Century Men and composer of the 1972 classic Celebrate Life, died April 1. Red, 77, was born in Little Rock, Ark., and studied at Baylor and Yale Universities. Described by the Washington Post as “uncommonly creative,” Red’s extensive body of works includes more than 1,600 published compositions and award-winning arrangements. He was the conductor of the Century Men, an auditioned men’s chorus of professional musicians who perform in Baptist churches across the world. Greg Stahl, the executive director of the Century Men, described Red to ABP News as a “true giant” in the world of Baptist church music. In 1972, Red wrote Celebrate Life, a musical collaboration with book and lyrics author Ragan Courtney, which has become a classic work for Southern Baptist youth choirs. The 1991 song “In Remembrance” is from the musical. The Yale School of Music presents the winners of the annual Chamber Music Competition in a showcase concert on Tuesday, May 7 at 8 pm in Morse Recital Hall. 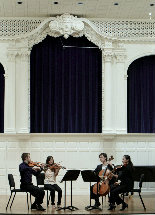 The concert is the last event of the 2012–2013 Oneppo Chamber Music Series.